In the waning days of 2009 and the first days of 2010, the lava dome on the summit of Soufrière Hills Volcano continued to grow rapidly. As the dome rises, rocks and debris can break off, cascading down the river valleys and gullies that radiate from the summit. These pyroclastic flows are among the major hazards created by Soufrière Hills. This natural-color satellite image shows the major drainages on the southern and eastern sides of Soufrière Hills. Tan deposits from volcanic flows fill the valleys, the product of almost 15 years of intermittent activity at the volcano. Green vegetation survives on ridges between valleys. The Advanced Land Imager (ALI) aboard NASA’s Earth Observing-1 (EO-1) satellite acquired the image on December 29, 2009. Montserrat is one of the Lesser Antilles Islands, an archipelago in the Caribbean Sea, north of South America. Many of the islands are volcanic, and their location roughly traces the edge of the Caribbean Plate along its boundary with the tectonic plates (North and South American Plates) beneath the Atlantic Ocean. The Caribbean Plate is overriding the North American Plate. As the plates collide, the mantle of the overriding Caribbean Plate melts, generating magma that rises to the surface and feeds Soufrière Hills and other volcanoes in the Lesser Antilles. NASA Earth Observatory image by Robert Simmon, using EO-1 ALI data provided by the NASA EO-1 team. Caption by Robert Simmon. 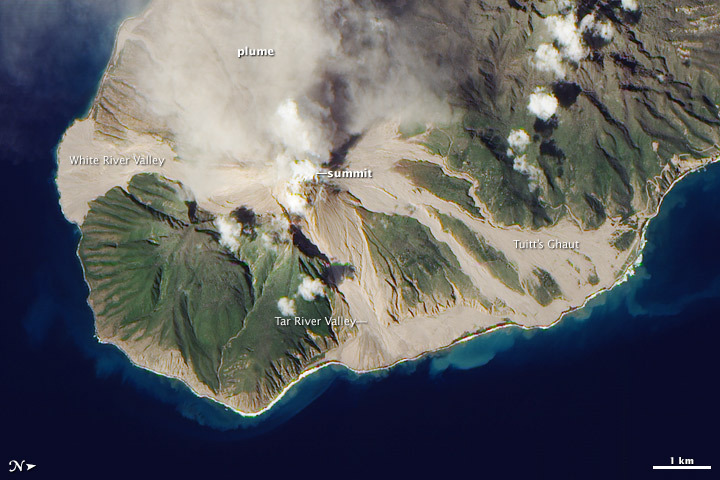 This high-resolution satellite image shows the river valleys and gullies that funnel pyroclastic flows on Montserrat’s Soufrière Hills Volcano. Montserrat Volcano Observatory (2010, January 2). Summit of dome changing rapidly. Accessed January 5, 2010. Montserrat Volcano Observatory (2009, October 22). Guide to the volcano’s major drainage valleys. Accessed January 5, 2010.